This engaging and inspiring video is the perfect companion to the Mopar® Brochures. Check out the video for detailed analysis of why Mopar Parts are the better choice. 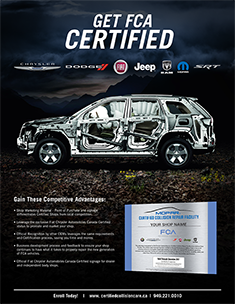 The FCA Recognized Collision Repair Facility Program provides customers with a repair provider choice that is Certified. The unique program identifies collision repair operations that have all the critical tools, equipment, training, and facilities to properly repair FCA vehicles to original manufacturer specifications. See for yourself just what makes Mopar® the superior choice for aftermarket parts. This comprehensive brochure provides a critical analysis of Mopar vs aftermarket parts using the five highest volume collision parts. 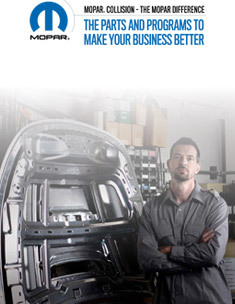 The Mopar Difference brochure also includes detailed information on key programs and web sites relevant to collision repair. With everything from corrosion test results to what’s inside a Mopar Reman engine, the Mopar Difference brochure is your go to resource for all your collision needs. CollisionLink® is a free solution provided by dealers for collision shops to order original equipment parts online for all automotive makes and models. Used by thousands of shops and dealers nationwide, it gives you access to electronic ordering of competitively priced OE parts with a seamless integration with most estimating systems. This document contains the body repair manual for the Chrysler 200 and includes proper welding, frame dimensions, paint codes and standard procedures. This document contains the body repair manual for the Chrysler 300 (2011-PRESENT), and includes proper welding, frame dimensions, paint codes and standard procedures. This is the body repair manual for the Chrysler J and K Convertible, which shows the typical unibody panels contained in these vehicles, weld locations, types of welds for each panel and proper sealers. This is the body repair manual for the Chrysler Aspen (2007-2009), which shows the typical unibody panels contained in these vehicles, weld locations, types of welds for each panel and proper sealers. This is the body repair manual for the Chrysler Concorde, Dodge Intrepid and Eagle Vision, which shows the typical unibody panels contained in these vehicles, weld locations, types of welds for each panel and proper sealers. This is the body repair manual for the Chrysler PT Cruiser Convertible, which shows the typical unibody panels contained in these vehicles, weld locations, types of welds for each panel and proper sealers. This is the body repair manual for the 2008-2014 Sebring and Avenger, which shows the typical unibody panels contained in these vehicles, weld locations, types of welds for each panel and proper sealers. This is the body repair manual for the Chrysler Sebring Convertible, which shows the typical unibody panels contained in these vehicles, weld locations, types of welds for each panel and proper sealers. This is the body repair manual for the Chrysler Town and Country (2008-PRESENT), which shows the typical unibody panels contained in these vehicles, weld locations, types of welds for each panel and proper sealers. This is the body repair manual for the FIAT 500, which shows the typical unibody panels contained in these vehicles, weld locations, types of welds for each panel and proper sealers. This is the body repair manual for the FIAT 500L, which shows the typical unibody panels contained in these vehicles, weld locations, types of welds for each panel and proper sealers. This is the body repair manual for the FIAT 500X, which shows the typical unibody panels contained in these vehicles, weld locations, types of welds for each panel and proper sealers. This is the body repair manual for the Dodge Avenger, which shows the typical unibody panels contained in these vehicles, weld locations, types of welds for each panel and proper sealers. This is the body repair manual for the Dodge Caliber, which shows the typical unibody panels contained in these vehicles, weld locations, types of welds for each panel and proper sealers. This is the body repair manual for the Dodge Challenger, which shows the typical unibody panels contained in these vehicles, weld locations, types of welds for each panel and proper sealers. This is the body repair manual for the Dodge Charger, which shows the typical unibody panels contained in these vehicles, weld locations, types of welds for each panel and proper sealers. This is the body repair manual for the Dodge Dakota, which shows the typical unibody panels contained in these vehicles, weld locations, types of welds for each panel and proper sealers. This is the body repair manual for the Dodge Durango (2011-PRESENT), which shows the typical unibody panels contained in these vehicles, weld locations, types of welds for each panel and proper sealers. This is the body repair manual for the 2004-2009 Dodge Durango, which shows the typical unibody panels contained in these vehicles, weld locations, types of welds for each panel and proper sealers. This is the body repair manual for the Dodge Dynasty, which shows the typical unibody panels contained in these vehicles, weld locations, types of welds for each panel and proper sealers. This is the body repair manual for the Dodge Grand Caravan (1996-2000), which shows the typical unibody panels contained in these vehicles, weld locations, types of welds for each panel and proper sealers. This is the body repair manual for the 2008-PRESENT Dodge Grand Caravan, which shows the typical unibody panels contained in these vehicles, weld locations, types of welds for each panel and proper sealers. This is the body repair manual for the Dodge Journey (2009-PRESENT), which shows the typical unibody panels contained in these vehicles, weld locations, types of welds for each panel and proper sealers. This is the body repair manual for the Chrysler Touring Sedans and Dodge Magnum, which shows the typical unibody panels contained in these vehicles, weld locations, types of welds for each panel and proper sealers. This is the body repair manual for the Dodge Neon, which shows the typical unibody panels contained in these vehicles, weld locations, types of welds for each panel and proper sealers. This is the body repair manual for the Dodge Nitro, which shows the typical unibody panels contained in these vehicles, weld locations, types of welds for each panel and proper sealers. This is the body repair manual for the Dodge Sprinter, which shows the typical unibody panels contained in these vehicles, weld locations, types of welds for each panel and proper sealers. This is the body repair manual for the Dodge Stratus and Chrysler Cirrus, which shows the typical unibody panels contained in these vehicles, weld locations, types of welds for each panel and proper sealers. This is the body repair manual for the Dodge Viper, which shows the typical unibody panels contained in these vehicles, weld locations, types of welds for each panel and proper sealers. This is the body repair manual for the Jeep Patriot, which shows the typical unibody panels contained in these vehicles, weld locations, types of welds for each panel and proper sealers. This is the body repair manual for the Jeep Commander, which shows the typical unibody panels contained in these vehicles, weld locations, types of welds for each panel and proper sealers. This is the body repair manual for the Jeep Compass, which shows the typical unibody panels contained in these vehicles, weld locations, types of welds for each panel and proper sealers. This is the body repair manual for the Jeep Grand Cherokee (WJ) (1993-2004), which shows the typical unibody panels contained in these vehicles, weld locations, types of welds for each panel and proper sealers. This is the body repair manual for the Jeep Grand Cherokee (WK) (2005-2010), which shows the typical unibody panels contained in these vehicles, weld locations, types of welds for each panel and proper sealers. This is the body repair manual for the 2011 to present Jeep Grand Cherokee, which shows the typical unibody panels contained in these vehicles, weld locations, types of welds for each panel and proper sealers. This is the body repair manual for the 2011 to present Jeep Cherokee, which shows the typical unibody panels contained in these vehicles, weld locations, types of welds for each panel and proper sealers. This is the body repair manual for the Jeep Liberty, which shows the typical unibody panels contained in these vehicles, weld locations, types of welds for each panel and proper sealers. This is the body repair manual for the Jeep Renegade, which shows the typical unibody panels contained in these vehicles, weld locations, types of welds for each panel and proper sealers. This is the body repair manual for the Jeep Wrangler, which shows the typical unibody panels contained in these vehicles, weld locations, types of welds for each panel and proper sealers. This is the body repair manual for the RAM 1500 (2009-PRESENT), which shows the typical unibody panels contained in these vehicles, weld locations, types of welds for each panel and proper sealers. This is the body repair manual for the RAM 1500 (2010-PRESENT), which shows the typical unibody panels contained in these vehicles, weld locations, types of welds for each panel and proper sealers. This is the body repair manual for the RAM Cab Chassis (2011-PRESENT), which shows the typical unibody panels contained in these vehicles, weld locations, types of welds for each panel and proper sealers. This is the body repair manual for the Ram ProMaster, which shows the typical unibody panels contained in these vehicles, weld locations, types of welds for each panel and proper sealers. This is the body repair manual for the Ram ProMaster City, which shows the typical unibody panels contained in these vehicles, weld locations, types of welds for each panel and proper sealers. This is the body repair manual for the Plymouth Prowler, which shows the typical unibody panels contained in these vehicles, weld locations, types of welds for each panel and proper sealers. This is the body repair manual for the Alfa Romeo 4C, which shows the typical unibody panels contained in these vehicles, weld locations, types of welds for each panel and proper sealers. ©2019 FCA Canada Inc. All Rights Reserved. Chrysler, Dodge, Jeep, Ram and Mopar are registered trademarks of FCA US LLC.